TOUTED AS the most promising young player in the world, Traigh Hunter Pathon will join a number of sport professionals and amateur golfers around the world for the launch of the SportsPodium Global Golf Challenge. Most promising young player in the world, Traigh Hunter Pathon will join a number of sport professionals and amateur golfers around the world for the launch of the SportsPodium Global Golf Challenge. 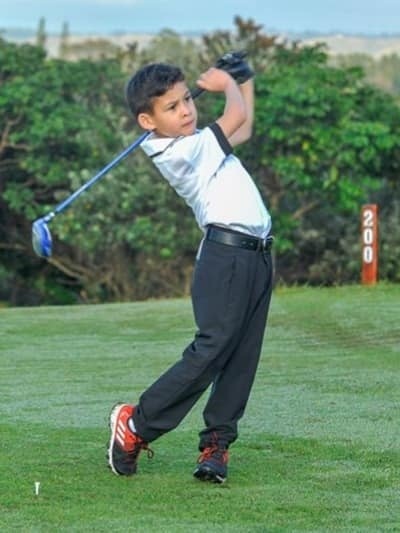 SportsPodium Chief Development Officer, Natalie Du Toit, recently became aware of this talented young golfer and his impressive achievements, and is excited to have South Africa’s newest golf sensation on board. A Blockchain based sports information database, SportsPodium was developed from a passion for levelling the playing field for sports people all over the world. Launching this new platform through The SP Global Golf Challenge, this innovative South African based company will soon be introducing other sporting disciplines. “App users will then be incentivised for their diligence, scores and achievements with PODs, or crypto tokens. These PODS will enable talented amateurs, like Traigh, to earn money and this will go a long way towards them being able to buy equipment and fund their own opportunities,” du Toit explains. Any golfer, anywhere in the world is invited to participate in the world record attempt. To participate in this challenge, simply download the ‘SportsPodium’ app and log your profile information and scores to secure a feature on the international leaderboard. The SP Global Golf Challenge will run from 21 – 28 June.